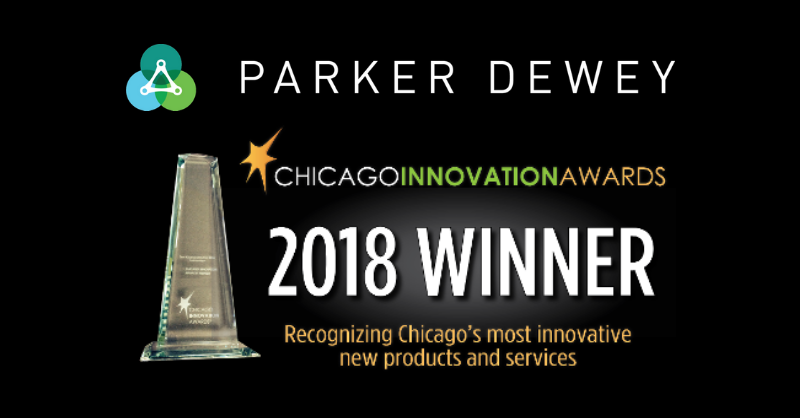 Parker Dewey (www.ParkerDewey.com), an organization that improves college-to-career transitions through its innovative Micro-Internship platform, has been named as a winner of the 17th Annual Chicago Innovation Awards. The winners were announced at an event held at Chicago’s Harris Theater on Monday, October 29, with nearly 1,500 business and civic leaders, and supporters of innovation in attendance. The Chicago Innovation Awards, celebrating its 17th year, is the Chicago region’s foremost recognition of the most innovative new products or services brought to market each year. Since launching in 2016, Parker Dewey has helped hundreds of companies ranging from emerging ventures to Fortune 100 enterprises engage highly-motivated, domestic college students and recent graduates on short-term, paid, professional assignments. Not only do these Micro-Internships provide immediate support to busy professionals, but they also help companies address the diversity, retention, and other challenges associated with entry-level hiring. As a result of these opportunities, Career Launchers across the nation have demonstrated skills, improved academic outcomes, explored career paths, and ultimately found the right full-time jobs upon graduation.